Your Instagram campaigns need to make your followers stop dead in their tracks and spark immediate reactions—engagement is the name of the game and your key to Instagram success depends on it. But with the long list of demands that social media managers face on a daily basis, it’s easy to hit writer’s block. So if you’re looking for inspiration? You’ve come to the right place: we’re sharing the best Instagram campaigns of 2018. We’ve sorted them by industries to help you stand out from your competitors and achieve your goals as efficiently as possible. Instagram accounts that act as a never-ending stream of news naturally struggle with engagement. It’s hard to get your audience to engage when they’re faced with news. 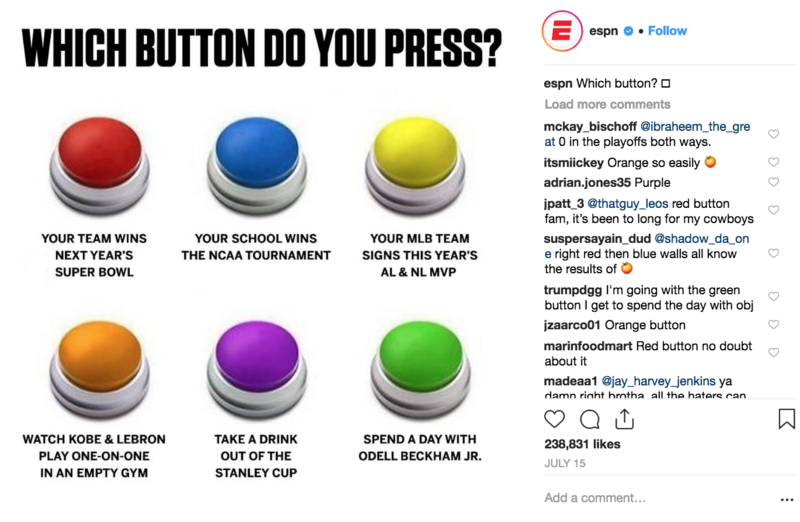 The leading TV sports channel, ESPN, typically gets between 500 and 2,000 comments. With the following engagement campaign, however, they managed to attract over 30,000 comments. But how, you might be wondering? Leveraging the success of online quizzes, ESPN asked a question that was bound to trigger the emotions of passionate sports fans. Followers were given six polarizing options to choose from, and many of them chimed in long after this poll went live. The takeaway for marketers: Break from the norm with Instagram content that plays into your audience’s emotion and gets them to participate. This has the potential to raise engagement and generate interesting audience insights and feedback, as well as new followers. Grab our ebook Your Guide to Instagram Stories: Measuring What Matters to take Your Instagram Stories game up a notch! 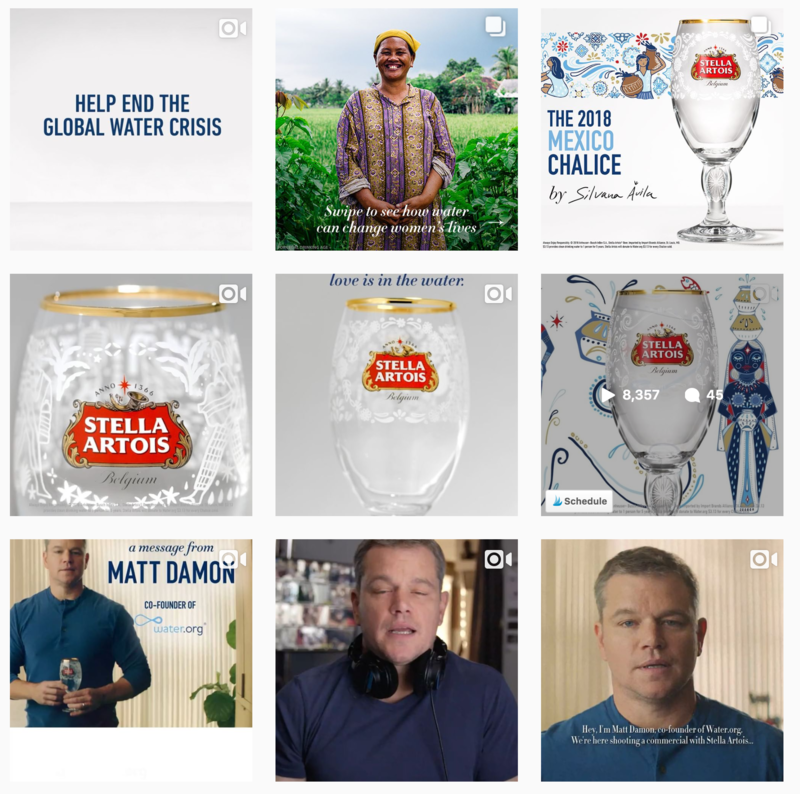 Belgian beer brand Stella Artois kicked off 2018 with an entire quarter dedicated solely to raising awareness and funds for their charitable partner, Water.org. For the duration of the campaign, the purchase of every Limited-Edition Stella Artois Chalice helped provide 5 years of clean water to someone in the developing world. To promote the sales of these chalices, the beer brand published a combination of short product and talking-head videos with Matt Damon, the co-founder of Water.org. They also used the #GiveThemTimeBack hashtag that sparked other brands and individuals to support the cause. The takeaway for marketers: If your brand supports a charity, make space for it in your Instagram strategy. Run an Instagram campaign that aligns your brand with the charity in a supportive way and drives emotions and encourages your audience to take action and support the cause. You wouldn’t expect another content platform to earn a place on a list like this, right? Well, YouTube absolutely nailed their UGC strategy this year! The video streaming giant found an ideal way to celebrate their viewers along with their creators by regularly posting fan art on Fridays, and giving it the appropriate hashtags: #YouTubeFanart and #FanArtFriday.